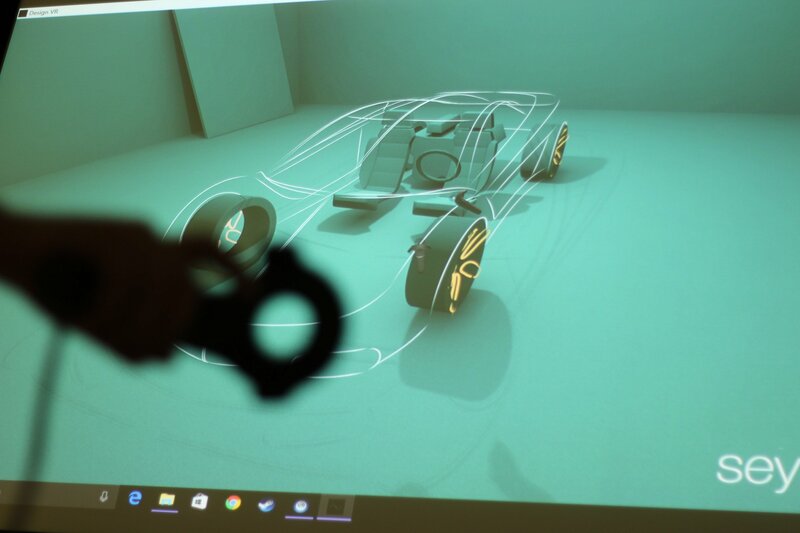 London studio Seymourpowell’s virtual-reality tool for automotive design allows people in various locations around the world to work together in real time. Debuted at last week’s London Motor Show, the tool enables collaborators in different locations – whether international or elsewhere in the same building – to observe and participate in the design process as it happens. Seymourpowell believes that by increasing efficiency and collaboration, the software “will help to shorten the time it takes to bring a new car from napkin sketch to showroom floor”. “What we needed was something that was specifically a design tool for 3D drawing and modelling,” Seymourpowell’s lead automative designer Richard Seale says in video made by the company. Using the software, collaborators are able to “dial in” to a project using either a virtual-reality (VR) headset or a tablet. If using a tablet, they can view an augmented-reality version of the work-in-progress on their screen, with the sketch overlaid onto an image of the room in front of them. The studio envisages the software, which was developed entirely in-house, being used across design, engineering and marketing teams. It is compatible with all major PC-based VR headsets, like the HTC Vive. In addition to its collaborative functionality, the software features advanced sketching tools, allowing designers to draw smooth curves over set points and work within safety parameters. Seymourpowell is a multidisciplinary studio that often works with emerging technologies. Previous projects include the modular Fairphone 2, a set of concept gadgets for Google’s Project Ara phone and a TV for LG. Virtual and augmented reality tools are increasingly being adapted in design and architecture, where they are reshaping the design process. A similar software, Gravity Sketch VR, launched in beta earlier this year, while 2016’s Tilt Brush by Google aimed to bring 3D drawing to a wide market. Other apps are helping designers understand how their creations will be experienced in various conditions or by different groups of people. An example is Scottish architect David Burgher’s Virtual Reality Empathy Platform, which mimics the visual impairments experienced by dementia sufferers to help architects design better spaces. In 2015, visualisation artist Olivier Demangel of IVR Nation told Dezeen that he expected virtual architecture to be as convincing as the real thing within five years and provide an experience “more powerful than cocaine”. The post Seymourpowell demos VR software for collaboratively designing cars appeared first on Dezeen.